Kaboom and here we are starting the 6th month of 2014! In blog-hop-land it also means that I get to introduce you to the next stamp of the month from Close to My Heart! This month I’m joining 50 Close to My Heart consultants to showcase art from the June Stamp of the month. From my blog you’ll hop through in a big loop and in the end you’ll end up right back here! If you’re already on the hop, you should be coming from Shelia's blog. If not, just hop on through the whole hop and you’ll find her as you complete the circle. 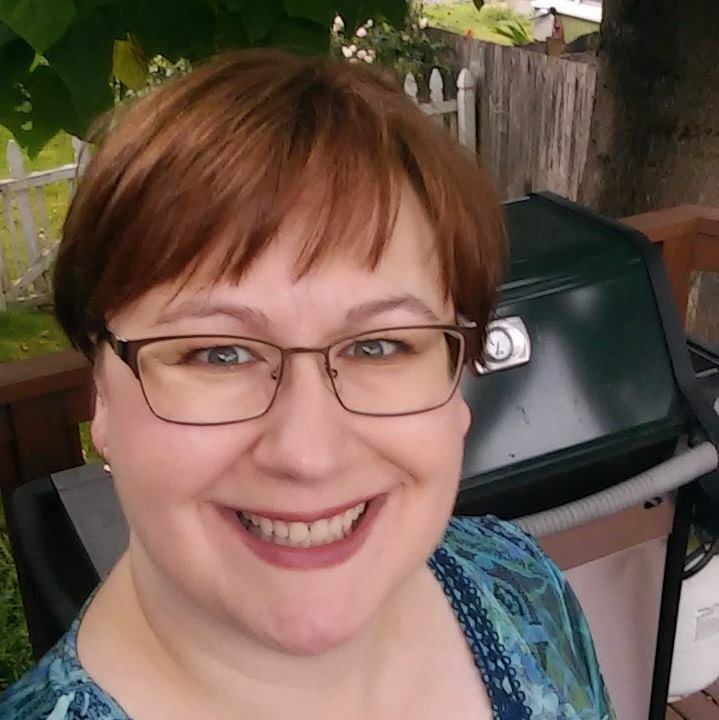 If you get lost along the way hop on over to Melinda’s blog for the MASTER BLOG HOP LIST. Now for some fun! This set really is called KABOOM! It features 14 stamps including 4 that match up with shapes on the Art Philosophy Cricut Cartridge. I grabbed this set a week ago to whip up this card below. Click here to pin it. 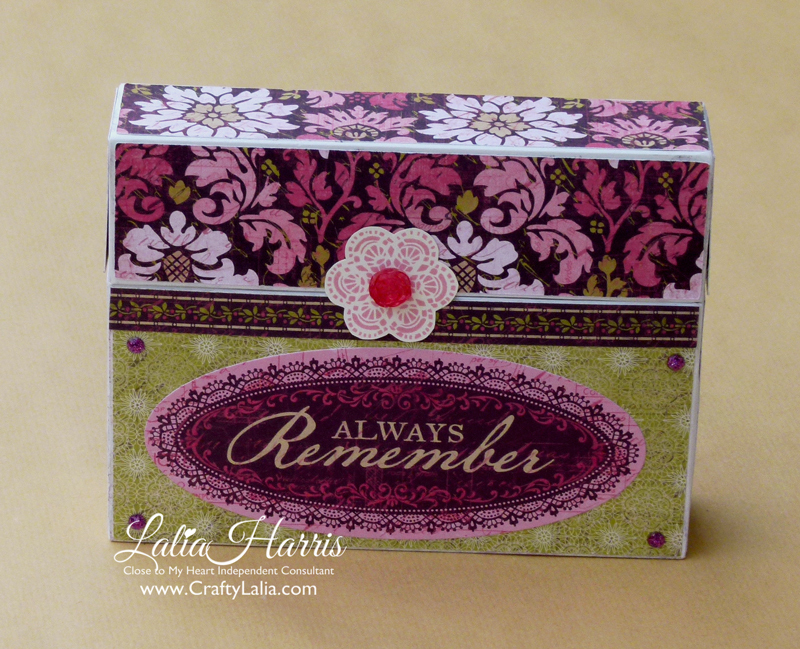 It was super fast to put together if you’re not afraid of a little background stamping. The card base is from Artiste. It’s a swing card and can be found under the “S” key of the handbook. Clever, eh? There’s a few of these little tricks on this cartridge. How about Movies & Mustache? Where could we find them? Psst… look on the M button! I digress… but you should take a peek! I used Crystal Blue cardstock along with scraps of Buttercup yellow patterned paper from Babycakes paper pack & the Lagoon striped from the Skylark papers for the dove-tailed banners. A bit of Ruby Washi tape added some fun and tied the elements together. 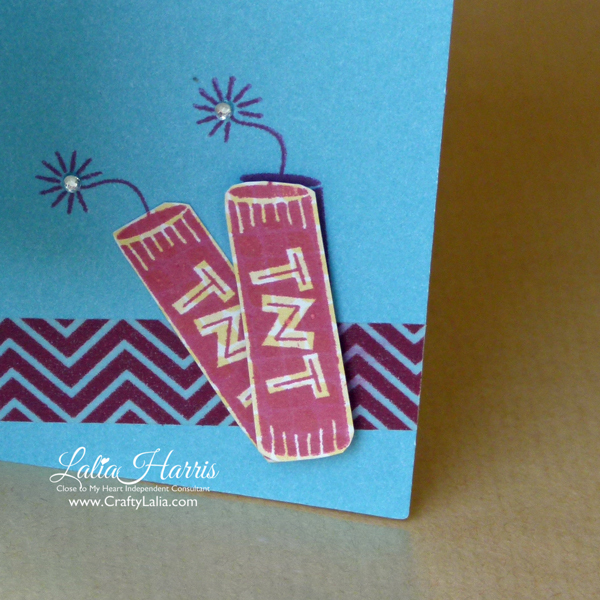 I fussy cut the TNT sticks and popped them up with 3D tape. I stamped the same image below so I would have perfect glowing TNT fuses. If there’s ever been a card that has really been enhanced by sparkles, this is it! Those fireworks just glow! 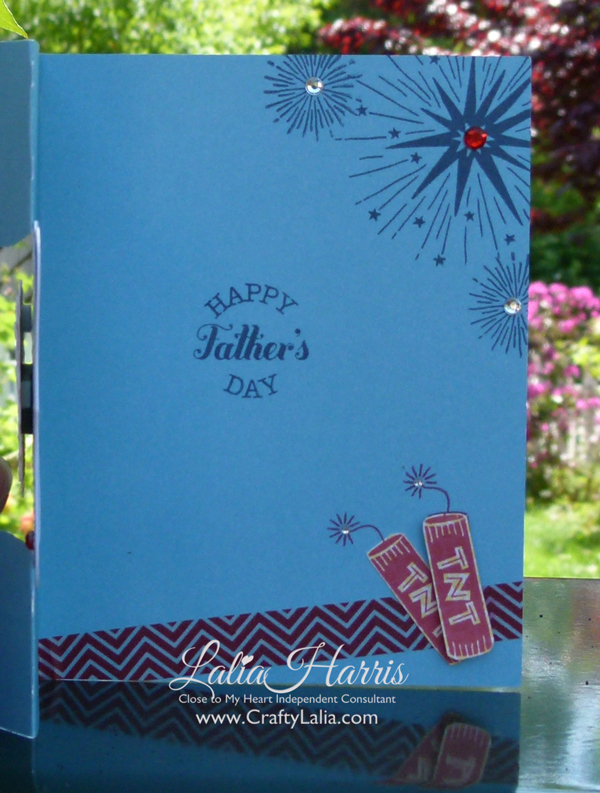 I designed this as a Father’s Day card for my Fun & Fab ladies on the 4th Friday workshop. I think you’ll understand that I like patterns and mnemonics. (They really help me and my Fabulous ladies). I may make a couple extra and send them as thank you cards. That’s all I have for you tonight. I will have more posts up this month using these stamps so please hop on back! For now, please hop on over to Judy's Blog check out her project. You’re invited to my 3rd anniversary party! Week 1! It’s been three AMAZING years with my Close to My Heart family. Three unbelievable Cricut Cartridges and way too many fabulous stamps and paper packs to count! We’re going to partying for the next 3 weekends!!! Please join me & win prizes on the CraftyLalia Facebook Page! I'll be posting some of my favorite projects from this spring all weekend. Like, Comment, Tag or Share any or each post to enter a drawing for a paper pack or B sized stamp set. If I get to 300 Facebook likes I'll also give away a Workshop on the Go (or 3 paper packs you get to pick)! #LikeCommentShareWin! #Celebrate! I’ll be shipping prizes directly from CTMH so they can only be awarded to US addresses. Thank you for 3 fabulous years! I’m delighted to offer this card workshop with the Ivy Lane papers and compliments. I fell in love with the Ivy Lane papers and compliments when I first received the CTMH Idea Book knowing that I could create a little workshop with them. I never expected to be able to create a whole set of TEN all occasion cards. It’s fast + flexible = fabulous! Fast: Everything is pre-cut. No inking or distressing required. Everyone will receive their own kit including embellishments. Flexible: You choose the sentiments. Birthday, condolences, just a note, or a few of all! I used Oodles of Doodles and Sincere Expressions. Big Hug would also be an excellent choice. I’ll have all of my sentiment stamps available at my workshop. You can also use your favorite set. Here's how to get the fabulous kit! Cost $30 for all supplies including adhesive, inks and stamps. Workshop will be at my home in Everett. RSVP & pay no later than 6/6/2014. RSVP by 5/31 and you’ll receive $5 off your kit. I will not order your supplies until they are paid. You may mail a check or credit card (see below). If you cannot attend, you can pick up your kit supplies anytime after the workshop. Stamp Set of your choice Oodles of Doodles, Sincere Expressions, Big Hug are great options. Contact me for more information or to sign up for this class. Please contact me no later than June 6th if you would like to join us for the class. Kits ordered before 5/29 will be mailed by 6/12 and will receive $5 off. Kits ordered after 6/6 will be mailed within 2 weeks. All kits/classes need to be paid for in advance. To order a kit(s), you may either send me a check or pay securely online with a credit card or your PayPal account by using the PayPal “Add to Cart” buttons below. Be sure to use the drop down menu to choose your kit option. (If you would like your kit shipped, please choose the shipped option. $7 will be added for shipping.) **Sorry shipping is so high, I'm charging actual shipping cost. A flat rate of $7 will be charged for shipping. Combine your order with a friend and save. Consultant and DIY’er Instructions available: Would you like to create this workshop with your customers using your own supplies? This option is designed for consultants but is not limited to only consultants. 7/10/14 Update: Check supply inventory before ordering as supplies are running out. 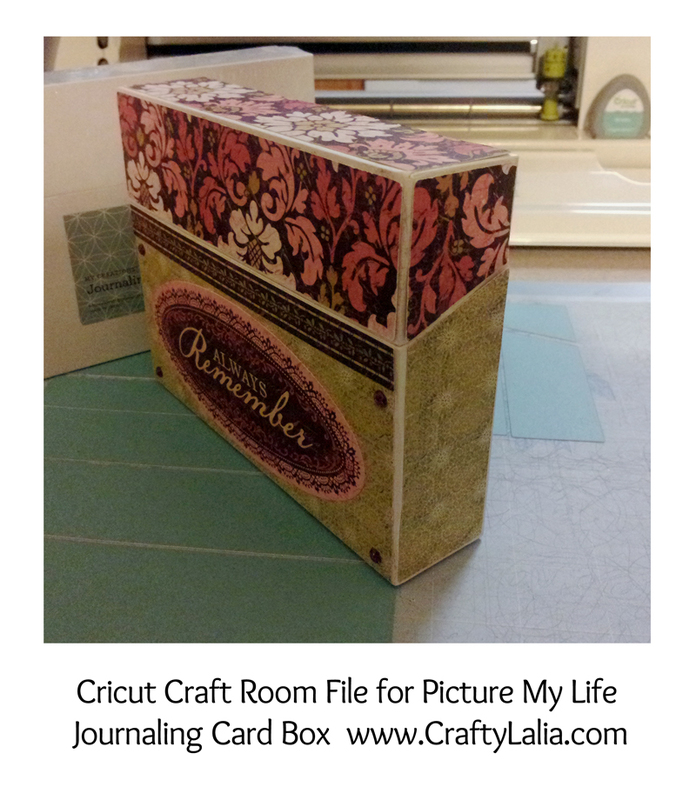 You will receive cutting diagrams for the cards, workshop release and a Cricut Craft Room File to quickly cut the pieces for the Journaling Box. Just make any $10 purchase on my website and I’ll send you the files & consultant release. The workshop release will enable you to offer this workshops and classes to your customers. You will not be able to sell your own kits online. That would be competing with me. If you are outside the US, email me and we can make it work. Remember: All of my team members receive my workshop files for free! Click here to see how to join my team. This post is a copy of my newsletter to local customers. (Sorry about the crazy formatting) If you’re not receiving my newsletter click here to sign up. Upcoming Workshops Add these to your calendar! It's in just 2 days! But I thought I'd mention it because I have room for a couple more people. Please RSVP by Thursday. We’ll be creating this card created by my Presidential Director Naomi Smith. You can also make it into a Father’s Day card by changing the sentiment. This month's workshop will be for the men in our life. We'll be making masculine birthday cards as well as Father's Day cards. You'll be able to customize them to make as many or few Father's Day cards you need. 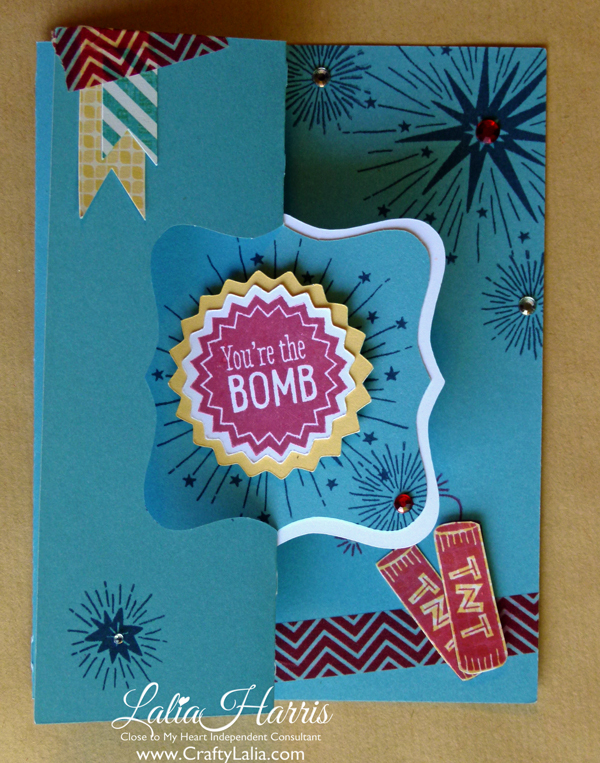 We'll also be making a Celebrate card, perfect for a graduate or other special occasion. Cost $15 for 5 cards. $5 discount when you shop my website or place a $25 order that evening. Girls 10 and up with their moms are invited to an evening of papercrafting! This night will be about stamping basics. In May we'll be making 3 cards & a 3D box or bag for $10 (Moms can make their own set, just let me know when you RSVP). You'll need to bring your own sharp pointed scissors and adhesive (tape runner preferred). I have Tombow for sale $3 ea or $2 for refills. You'll be making a gorgeous kit of 10 coordinating cards using the Ivy Lane paper pack and coordinating stickers. This is a very simple workshop with elegant results. You'll be able to customize the cards with your choice of sentiments. This workshop is also available as a kit that you can complete at home. You do not need to be local to participate. Cost $30 RSVP no later than June 6th if you want to attend the workshop. You can purchase this kit anytime, until supplies run out. Register & pre-pay by May 29th and save $5. Email me at LaliaH@live.com to RSVP, receive my mailing address or request a PayPal invoice. A card kit without the box may be purchased for $23. 5 beautiful cards including a beautiful one for anniversary or weddings. Cost $15. $5 discount when you shop my website or place a $25 order that evening. 5 beautiful cards. And a preview of the brand new Annual Inspirations 2014-2015 Idea Book! Pick a time that's flexible for your and your friends. I love taking my workshops on the road. Let me know if you're interesting in holding your own card workshop or gathering. You can earn your workshop for free or receive free product! As summer approaches, I'd love to find a group of friends who want to meet during the day. Today in the Amazon Appstore (Android compatible) are 9 free photo apps. I’ve managed to download them and I’m most excited about the first one Rhonna Designs because I’ve seen it in use and I just hadn’t gotten around to buying it! Another benefit is that each one of these FREEBIES earns you 100 coins or $1.00 app credit for future app purchases! With a few of those coins my son will get to play on MY kindle. Happy boy, happy momma. This post contains affiliate links. See sidebar for details. There’s an incredible feeling to finishing a project. Especially one that has been on your desk for 3+ months! 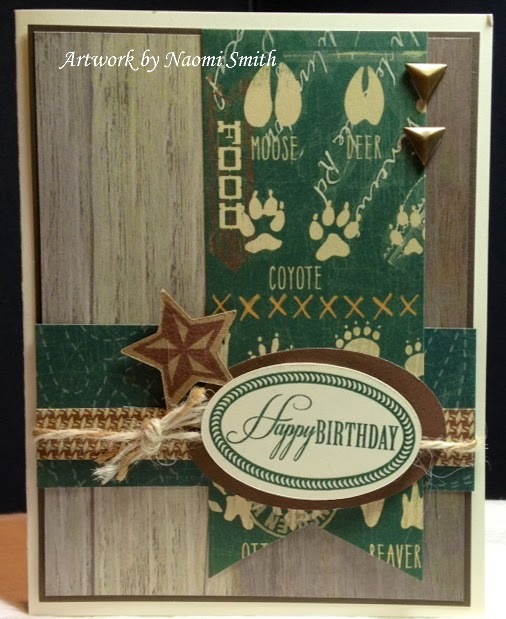 I created this card, with the Artbooking wood grain overlay months ago. I even added the strip of Ivy Lane B&T papers across the bottom. In April, I was met with a challenge to create a piece of artwork using a cartridge and one of the stamps that came in the bundle. That was my call to action. The Artbooking cartridge was designed for scrapbooking but its elements can be used in so many more ways than that! You can get your own Artbooking Cricut bundle from my website today. Or click here to see more about the CTMH Cricut Collections.